We got up early and headed over to NOAA. 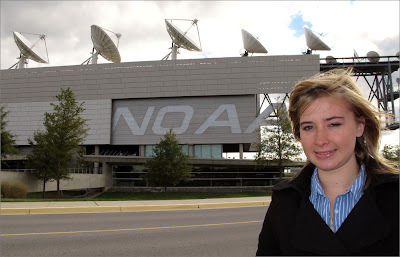 Visiting NOAA was great. They showed us all the records of when I activated my Epirbs and showed how right after I set them off two satellites went over me, got my position and then remembered it and passed it down to the first earth receiving station that came in their range which was in Pakistan of all places. 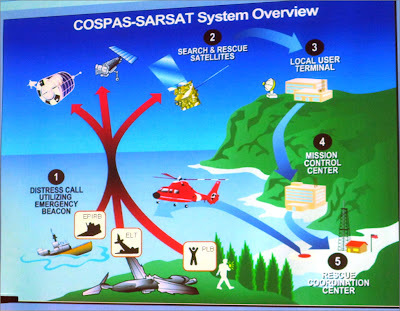 They gave a talk on how the satellite system works. It was great to meet all the people that worked there and I was surprised to learn how often they had signals coming in. We got to walk all through the building, go up on the roof and see where they first get in the signals and everything. 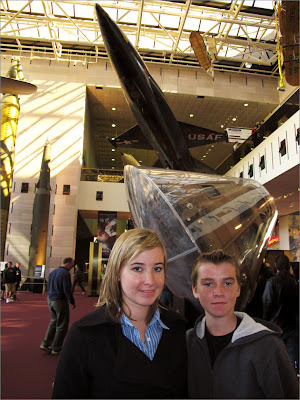 After we finished at NOAA, we headed over to the air and space museum where we spent a good part of the rest of the day. It was pretty cool place; one of the few places I hadn't been to already with all the times I've been back there recently! So all in all it was a good, long day. On the ride home, Scott called around and found a place to go and rent little sailboats, so we had some fun plans for the next day. We went to sleep that night hoping the wind would pick up a little bit for our sail around the Chesapeake! You are really getting an amazing education. How about the big rally today in DC? It's great to see that you're taking the opportunity to travel. DC is an amazing place. I've been down there a few times since my sister went to Grad School there. What a terrific time you've been having! Learning all those things, meeting so many interesting people, and getting to see so much of the world around us. Love DC, glad you're having a good time! omg! you're so luckly! hope you're enjoying this wonderful experience.. is an amazing opportunity for personal mature:)..
go on and enjoy enjoy enjoyy! ♥ best wishes from Argentina! Great that you continue to be an inspiration to us all. So much of the time most never get a look at how stuff works. We push a button and something happens. Thanks for giving us a look at NOAA. ASM has always been a fun place, it the World above the water that sometimes end there, enter NOAA. It is a big circle. "Well, I'm seventeen and I'm crazy. My uncle say the two always go together. When people ask your age, he said, always say seventeen and insane. Isn't this a nice time of night to walk? I like to smell things and look at things, and sometimes stay up all night, walking, and watch the sun rise." Abby near my home here in Newfoundland,Canada is a grass strip (still used ) where Earhart took off in 1932 for her flight across the atlantic. I am sooooo glad that you got to see the Air & Space Museum. You (and Toby) will probably remember that place all your life. The day that Zac got in I went down to the dock and looked at Intrepid close up. It reminded me of when I went to the Air & Space Museum and saw all those frail craft that are so famous. I thought that someone should have picked up Zac's boat, just like it was that day, and put it in a museum. That day it was all weathered and beat up. It left a vivid impression on me of what Zac and Intrepid had gone through. When I talked with Jessica Watson in Long Beach I asked her about her boat and she said that it was currently in dry storage and would probably end up in a museum. The down side was I think that she really misses her boat. Have you thought about your next boat yet? Thanks for the details of how the satellite system worked for you. And the photos by Bill are excellent. Of course the photo of you in front of Amelia's Lockheed 58 Vega gave me food for thought. Amelia Earhart actually served as a military nurse here in Canada. And there are records of her visiting the military air base 10 miles from my home. Closer to you Abby...Amelia's first encounter with an airplane came on Christmas Day 1920 when her father took her to the official opening of a new airfield in Long Beach. It was here she had her first airplane ride. From what I have read she had (respectfully) a persistent character like yourself. I believe that plane behind you was used to make her Atlantic crossing solo from Canada to England. After 13 hours of non-stop flying the exhaust pipes were burned out and fuel was leaking from the fuel tank. She felt she could not reach Paris. To avoid a crash she made an emergency landing in an Irish cow pasture. Despite not reaching her destination Amelia had completed the Atlantic crossing solo. Just like you she has an inspirational story. You are still (yet?) setting records as you explore our world. You sail on in our hearts even now. Thank you for the updates and for continuing to share the adventure of life with us, you are a spot of fresh air. As always, GO GIRL GO!!!! I was at Goddard Space Flight Center (NASA) in Greenbelt a few days before your talk. My friend Verner Eissner from Stuttgart gave a talk. It was about how photons behave in the center of the sun, particles from ionized hydrogen and helium. My father was the MC. There was a fellow there who builds the satellites that collect the data. I used to write programs to make pictures of the gamma ray data from the sun when I was 15. It was fun. Were you at Goddard or the headquarters downtown? My papa's friend down the hall got a Nobel Prize for figuring out the temperature of the background cosmic radiation. It's the same all over. It's evidence or proof of the big bang theory. I thought that was neat. I still have to figure out what my papa is researching. The Collision Process. Hello, Abby! It's so interesting to follow your steps "on earth"! Thank you for sharing your trips and new experiences - a completely different world for me. It's so nice you meet everywhere friendly and sincere people! Hi Abby - It is nice to read your blog entries. What wonderful opportunities to travel and speak to various groups you are having. Glad Toby is able to enjoy this latest east coast trip with you. Washington, D.C. is packed with interesting places and things to see so I am sure your days are very full. It is great that you got to visit NOAA and see how the technology worked when you needed it most. Looking forward to hearing more from you! Hello Abby, I am fun of the adventure world!! Go go. We are more people!! Here Tucuman (Argentina) follow we dream´s!! Abby, such really nice pictures and what an interesting trip! Can't wait to see your next adventure. As always stay safe. Any idea on the current location of Wild Eyes? Saw you at NOAA- wished I would have said hi. Be well. I am really glad to hear you had fun. Enjoy! Abby, if you wanted to sail around the Chesapeake Bay, I believe you had a seat waiting for you on one of the Schooner Woodwind(s) (72 ft) beautiful craft. They pulled them out for the Winter soon after you left. Maybe next year you can come back and race one of your brothers. The Air and Space Museum is awesome - so glad you all got to see it! Sounds like they gave you a good education at NOAA - it must have been kind of surreal to be looking at your own data like that. 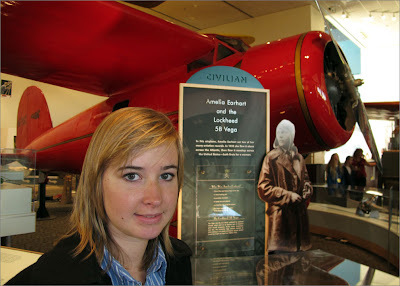 Abby~ I love seeing you by Amelia Earhart's plane. It means alot. Yeah, I love SATCOM systems! You have some really awesome pictures. I am a certified weather spotter with the Boulder, CO branch of NOAA. Certified through NOAA. So your information is really interesting, which you are sharing. I'm glad you are doing well. I hope everything else is going well too. You can check me out too, on Facebook: Rita Klatecki. I'm not computer literate enough to how to put the URL when it needs to go! Thank you for sharing with us all your interesting journeys. Neat stuff. You have great blog, keep up the creative work. I really enjoyed this last post, I imagine that would be very interesting to see how the rescue procedure works. Things always seem so different when you get into the background and workings of something as involved as a search and rescue, especially when it involved yourself. It also makes us very appreciative of all the people and equipment that is available for missions such as yours. God Bless all those involved. Hope you got some good wind for your sail around the Chesapeake and enjoyed it. In your last post, I got a kick out of “Smiling Toby” being the only guy, sitting there amongst all those pretty ladies. Nice Birthday gift Toby. Take good care of yourself Abby and enjoy your travels. Loads of love and hugs, and remember God is always with you. Dont take a single day for granted as you are living a life that many others your age will only dream of!